Part of the proposal to develop the tract where Stop & Shop and other stores now stand: One, two and three floors above a first floor of retail that would replace the supermarke’ts current building just south of West Avenue (with as many as three floors above West Avenue). That was one of many features of a “proposal” for redeveloping the 8.6-acre site covering most of the land between Edgerton Street, Heights Road and Noroton and West Avenues, owned by Federal Realty, a national real estate investment company that bought the land from Tom Golden’s estate after that developer accumulated the parcels and passed away. Overall, Federal Realty presenters told a joint meeting of the Planning & Zoning Commission and Architectural Review Board Tuesday evening in Darien Town Hall, the developer’s goal is to create a vibrant, attractive place that people want to visit, walk around in and enjoy as well as shop in, dine and spend money. The company presented something that was at least as close to a concept as an actual plan, with many details open to changes. Instead of sketches describing what the buildings might look like, they presented — with the exception of a rendering of housing along West Avenue — pictures taken from elsewhere that were meant to suggest what they might build, or possibly even just a sense of what their buildings would feel like to look at. Possibly retaining Stop & Shop and Walgreen’s pharmacy, possibly not (Federal Realty is actively discussing the matter with both companies). Federal Realty, the presenters said, is used to owning large commercial developments that are very pedestrian-friendly, environmentally friendly and with large anchor retailers that are often grocery stores. This rendering shows the view at the intersection of Edgerton Street and West Avenue, looking southeast, where the Stop & Shop/Walgree’s building stands today. 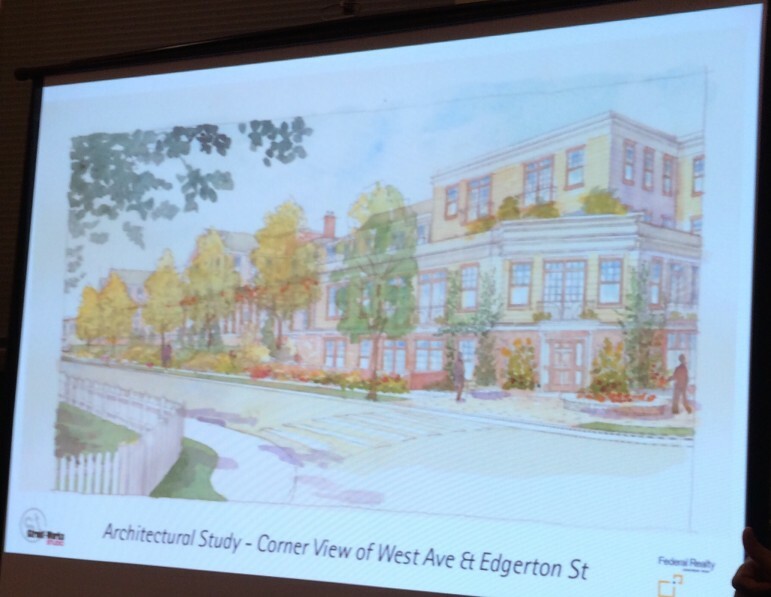 The main entrance (but likely not the entrance most people would use most of the time) would be at the corner of Edgerton Street and West Avenue. Planning & Zoning Commission Chair Susan Cameron and another P&Z Commission member pointed out that having cars stop to use the entrance might create more of a safety problem than the safety problem already existing at that intersection. She suggested that some kind of a place for cars to temporarily park off the street might be safer. Federal often will “really focus on ways that we can engage the broader community and bring the broader community in for more than just retail,” said Patrick Mahon, director of development for the company. In one development Federal brought in a farmer’s market and had chefs at restaurants on its property put on cooking demonstrations. Yoga classes and children’s events will take place in outdoor, public spaces outside the stores, he said. Two entrances off of Heights Road, on either side of the building where Citibank now sits, would be the main entrances into the development, along with an entrance off of Edgerton Street, roughly where the present parking lot entrance is on that road. Just to the west of Citibank would be a pedestrian open space with a kiosk selling food or coffee, park benches and perhaps a nearby ice cream shop, said Timothy Mount of Street-Works Shop, a consultant for Federal. Craig J. Flaherty, an engineering consultant with Redniss & Mead, hired by Federal, said the drainage problem at the low points of Heights Road can’t be solved by developers, although they can mitigate it. With a watershed area of 116 acres draining to the lowest area of Heights Road and with the highway and railway helping to dam up the water, whatever is done on the 8.6-acre site, even if none of the rain that fell on it were to be disposed of elsewhere, “we’d only be shaving bits off the top,” he said. Much of the ground underneath the site is ledge rock, he added. The Planning & Zoning Commission on Tuesday approved new zoning regulations for the two major Noroton Heights business district redevelopment proposals that, among other changes, limit building heights to 45 feet and apartment sizes to 1,500 square feet. First Selectman Jayme Stevenson told the commission that she wants to work with the developers in a public/private partnership on a drainage system that will improve the current situation, in which Heights Road and some of the storefront space facing it get flooded in major storms. The resolution incorporating various zoning changes, which was approved unanimously by the commission, includes language encouraging that. The landlord that owns the buildings where Stop & Shop, Walgreens, Equinox and other nearby stores are now located wants to add about 90 apartments, more retail space, over a hundred more parking spaces and a lot of landscaping to the 8.6-acre tract. According to some documents filed with the Planning & Zonning Department, Federal Realty will present its ideas for redeveloping the site, which takes up much of downtown Noroton Heights.